Everyone has the desire to have the friendship that lasts long-term and the memories of all time. Always together when sadness or happiness. Tears or laughter, friends will always be around! Friendship is a most important and the most lovable one. A friend is one that knows you as you are, understands where you have been. Apart from the family members, you need some people that might encourage you and who might listen to you and available to you when you need them. True friendship is all about care and trust. Did you know that social interactions with friends can enhance positive life, such as stopping smoking, the desire to workout, or eat the healthy foods? A close friend which will be a reminder to you to stay more healthy lives. Based on studies in Carstensen, the three friends are the perfect number, they’ll help each other if one in a state of crisis and ‘drop’. However, less than three will most likely make sense of loneliness and depression. “Small friendship, but close, will make more high-quality mental health,” said Laura L. Carstensen, Ph.D., director of the Stanford Center in California. A close friend becomes replicate of you. In fact, a close friend can be your booster to achieve your dreams. The other facts. A friend is not just to share the happy moment, but a friend can be a panacea that can enhance your body when to suffer from breast cancer. In a study involving 3,000 girls who fight the breast cancer, those who do not have a close friend die earlier than women who have friends. Here, we see how a friend gives the spirit to fight the disease most feared by women: breast cancer. So, if you want to stay healthy and happy, you gotta have friends! 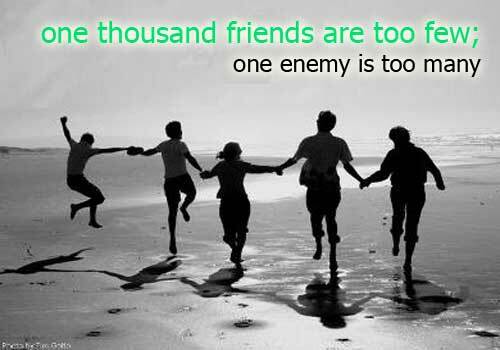 Please remember, one thousand friends are too few; one enemy is too many.